One pearl daily, with water or your favorite beverage. May be taken with or without food. Do not chew or crush. May refrigerate if desired. The inner layer is a paste of healthy probiotics suspended in a protective oil mixture. The second layer seals the probiotics in the capsule, and protects them from air and moisture. Probiotics are anaerobic organisms and the presence of oxygen can actually injure, weaken, or kill them. The third layer is a patented coating that protects the probiotics from the acid environment of the stomach, so they can successfully reach the intestine where they are needed. 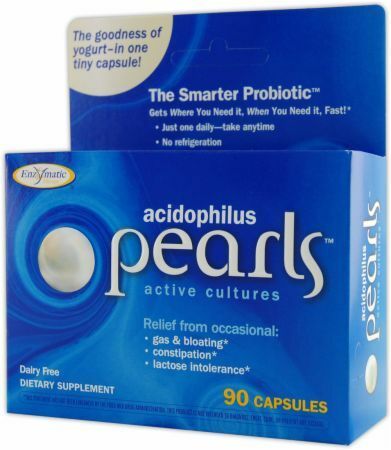 * Probiotics are not resistant to stomach acids, so the outermost layer of the pearl is specially developed to dissolve only in the alkaline environment of the intestines. Probiotics do not permanently colonize in the body. Therefore, they need to be ingested regularly for their health promoting effects to persist. * Since they are often killed or severely weakened by exposure to air while on the shelf, and by stomach acids when in the body, probiotics need to be protected until they can reach the intestine where they offer maximum benefits. That´s why Acidophilus Pearls are such a breakthrough.